Although a much longer distance than the previous day, this turned out to be the relatively uneventful day that I had expected the previous day to be. I drove to Abereiddy and parked the van there on a wide flat area of rough stone and earth behind the faltering sea defences. An information board notes that the sea defences are no longer doing their job, and their future is uncertain. As in other areas of Wales, and indeed the whole of the UK, hard decisions have to be made about where it is worth fighting the inevitable driving force of the sea. Here there are a small number of cottages, which would be threatened if the sea defences were lost. There is a large pile of huge boulders on one area of the car park, so this suggests that the decision has been made to strengthen the defences. For now, the sea is rebuffed. I had arrived an hour before the bus was due in order to make myself breakfast and prepare for the day. As I wait for the bus a party of schoolchildren arrive and start to get into wetsuits. I’d called in the car park the previous evening on the way to St Davids to check it had plenty of room, and there were people finishing an afternoon of coasteering, so I wonder if this is what the children are about to do. After arriving so early I almost missed the bus. I was reading when it arrived, but immediately saw it and got out of the van, and then another van, which had been stationary, started to manoeuvre between me and the bus, but happily I managed to flag it down before it left without me, although I had to pick up my SPOT device on the way as it fell out of its frayed holder with a clunk. I was glad this had happened in the car park; if it had fallen on the way I would probably have never heard. The fraying of the cover that clipped onto the rucksack started as soon as I got the device, but I’d not noticed it had got so bad. It does seem odd to make a safety-critical device and then have a holder that wears away so quickly. On the bus the people in the seats behind were talking about their day ahead. One was clearly in her seventies and had been walking for many years and was planning a nine-mile day. However, she said that the maximum she would think of doing was a twelve-mile day … and what was it the Ramblers told me? After she got off I moved back into her seat as I’d been on the front seat, and a lady got on with walking sticks, that is the medical kind, not the ones to help you walk distances. The buses that run round the Pembroke coast and are so useful for walkers are also a lifeline for local people in remote villages. The lady with the sticks exchanged banter with the bus driver during the journey and also told me about some of the things as we passed. There is the large house at the top of the hill in Porthgain where the husband was an architect and the wife watched every step of the builders’ progress, "I’m paying for it and I’ll have it exactly as I want it." Then as we passed what had looked like a (modern built or restored) shepherd’s hut or road builder’s hut, she told me this was where (if I recall the name) Rhys Griffiths Jones lived, clearly expecting me to recognise the name. If my celebrity sense was stronger I’d also have recognised and recalled the name of the female celebrity who, the bus driver said, had been reported to have been born in Trefin, but, as the lady corrected him, had lived and been to school in Trefin, but really been born in Swansea. Several walkers got out at Strumble Head, and after turning on my various devices and taking a few photos, I seem to be the first to set off south and west. The day is a succession of spectacular caves and bays, with sheer cliffs and crashing waves. At various points I saw a tiny black lizard flash across the path in front of me, several wrens, and dazzling blue dragonflies that hovered tantalisingly above the path ahead, or sometimes bathed on small rocks under the noonday sun, but would whirr away as I came close, sometimes dragging a mating female with them, like a small and drab shadow. In nature it is always the men who are the dandies. At one point there is a group of ponies grazing, mostly mares with one stallion. 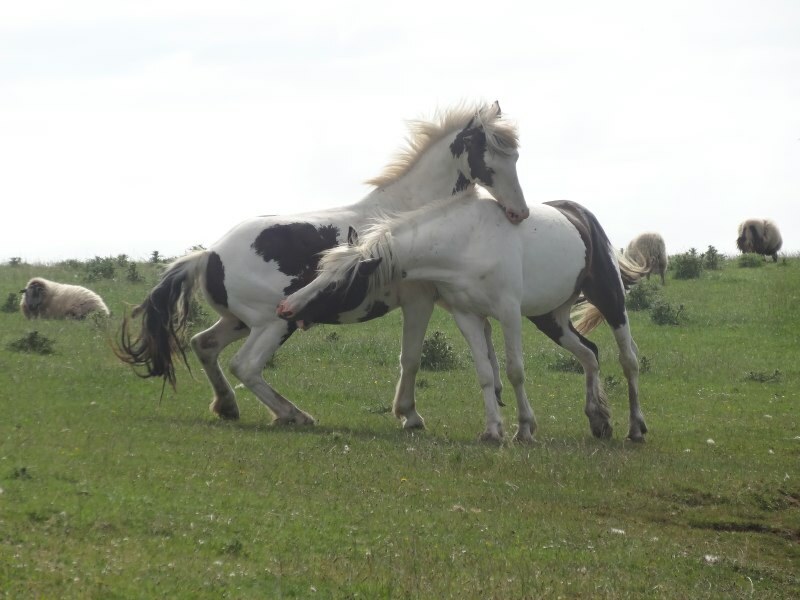 It was standing nonchalantly while two of the mares play-fought (or maybe fought) one another, leaping, butting, entangled manes and tails, almost like one fluid eight-legged creature. 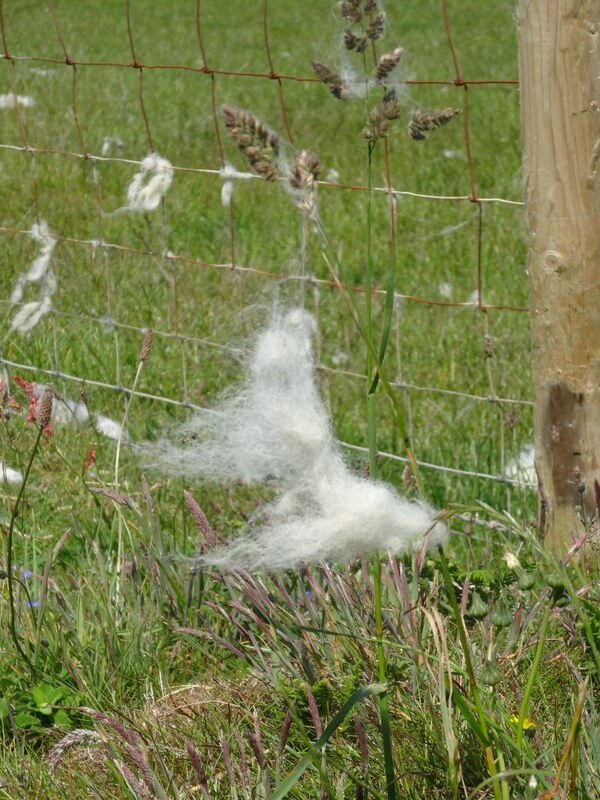 The stallion did not even bother to look interested; unlike the gaudy dragonflies vying for a mate, he could simply stand there, his credentials all too clear. There are also occasional patches with tiny holes in the path, barely 3mm across, and some fresh dug with fresh dry powdery soil dumped around. They did not look right there in the bare earth for any sort of colony insects and there was something near one that looked like a tiny blue/green wasp, so I wonder if this is some sort of ‘solitary’ wasp, which happens to be in clusters because conditions are right for digging there. I notice at one point a couple from the bus, who must have started out a little after me; when I stop to take photographs they get closer, but as I walk they recede. 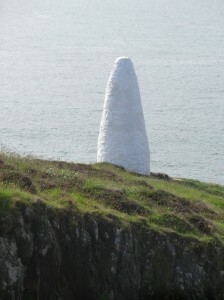 Past the Youth Hostel at Pwll Deri, the path runs briefly alongside the road, where there is a memorial stone to Dewi Emrys, 1879–1952 (a poet who won the Eisteddfod chair four times), and on to the mile-long headland towards Penbwchdy. It reminds me of following one of the mountain ridgeways of Offa’s Dyke, and while they are much higher in total height, they are not so much further above the surrounding land as this is above the sea. I meet a couple with two Cocker Spaniels, one very old and quiet, and the other bouncing with life and barking when another walker passed. She did not bark at me, maybe because I was already talking to her elder. We (that is the couple and I, not the Cocker Spaniels and I) talked about dogs and in particular Bernese Mountain Dogs as when I said we had once had one, they told me about a friend who breeds them, but where they find five Bernese at a time a bit much to handle when they visit. As I look back along the long headland I also see the first couple who left after me in the distance, but not again. Although my walking speed is a lot less than I had estimated before I started, I still seem to walk faster than most folk. I have never met many people along the Coast Path except close to major centres, but where I do I always overtake them, and never, to my recall, the other way round, except when there may be a period of me stopping to take photos, being overtaken or caught up, then when I continue, re-overtaking. This happened soon after this today with a young girl with a big backpack – and to be fair I carry very little – where I overtook her, then only just kept ahead as I kept stopping, and then she overtook again; the leap frog continued for some time, before she too faded into the distance. I had thought I might develop a more leisured pace, and maybe if my distance per day calculations had been more realistic, I would, but, walking eight to ten hours a day does not encourage leisure. The speed and often lack of rest stops may well explain some of the exhaustion … not to mention seven hundred miles. And this day the feet did hurt. A little further on I spotted a half stone circle against the cliff edge. It reminded me of the Neolithic fort on one of the Aran Islands where the limestone cliff has been eroded, leaving a perfect semicircle of fort perched above the waves; in another few thousand years it will all be gone, fallen into the hungry sea. I half imagine my first food (a Scotch egg) sitting where the cliff path passes the centre of the semi-circle: I’m not sure if that was a mystical or simply mathematically compulsive thought, but when I got close the stone circle turned out to be the stone cliff-top wall, giving a soft spot on the cliff edge a wide berth. The centre of the semi-circle would not be a safe place to be. Coming on to the beach at Aber Bach (the small mouth) the stream flows into a shingle bar and then disappears between the stones, only to reappear in multiple springs out of the pebbles a few yards further down the beach. A Coast Path sign offers an alternative route for times of ‘storm or flash flood’, the latter being when the tiny stream becomes a raging torrent, and the former because that’s what put these rocks here in the first place. Happily I suffer neither storm nor flash flood as I pick my way over the pebbles. Up and down and you are on Aber Mawr (the big mouth), a larger beach (as you would expect). 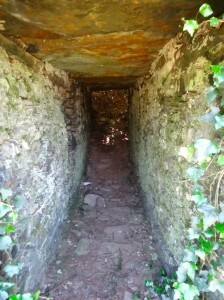 While Aber Bach had some small boats, Aber Mawr is empty, but on the far side, as the path climbs up the hill ready to skirt the cliffs, ahead is a stone doorway, a sort of flat-roofed store room or passageway set into the hillside; the path goes on to climb and turn to go over its roof. I can’t make out its purpose; it is neatly stone sided, with what looks like a slab roof, but appears to be open on the far side, albeit covered in thick vegetation. When going up over it the cliff side looks just as solid as the rest, but clearly there is some sort of depression there, so overgrown as to be invisible. Even looking back on the photos the hillside looks continuous. 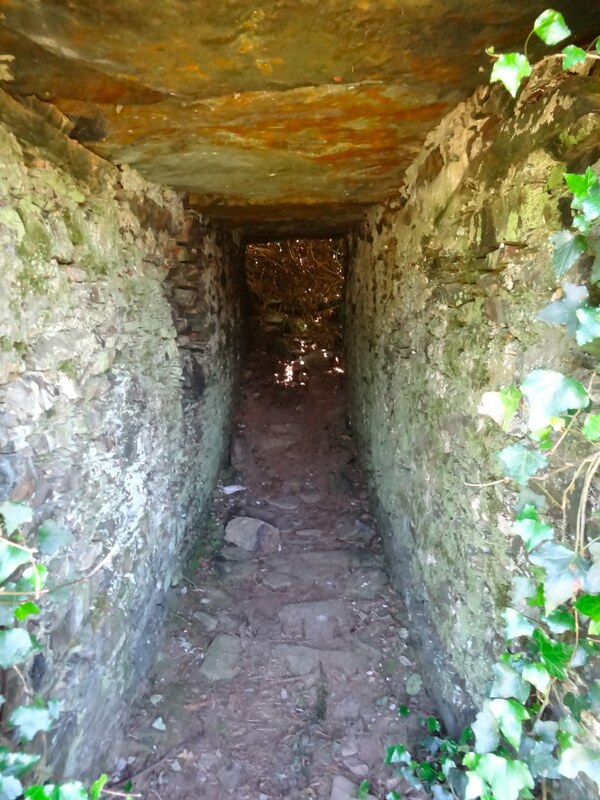 The only clue I can see on the map is ‘Quarry (dis)’, so maybe, under all the vegetation, is a small quarry and this was a short tunnel under a roadway that the current path follows. Some way on, past more needle rocks, sheep-wool-laden fences and green tumbling cliffs, you come to Abercastle, a natural harbour, with boats sitting on the low-tide sand, mostly pleasure craft, but at least one more serious-looking small fishing boat. The remains of some sort of old 19th century industrial building perch on the hillside and a sort of breakwater (behind where the boats lie) diverts the stream to one side of the bay. On the far side an upended cannon sits beside the path, its muzzle pointing towards the sky. I assume that rather than being set there as a form of 18th century anti-balloon gun, it was simply for tying up larger boats. Apart from fields of leeks near Cardigan, virtually all the clifftop fields have been grazing land, but now I start to pass wheat fields, the wind creating waves of light, and so I take my first (deliberate) movie. 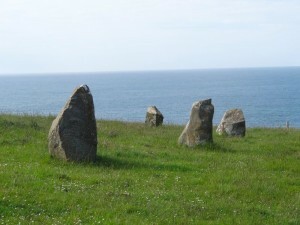 Further again a real stone circle appears in the distance, perched above the Trefin Mill. Trefin is just up the hill from the coast and the old mill sits just beside the shore. It would once have been a bustling small town with slate quarries, mill and lime kilns, but now sits quietly overlooking the sea. I know there is a pub in Trefin, but I decide to wait. I should note too that the Coast Path signs here in Pembroke do often point out the places where side footpaths lead, and certainly Trefin is clearly marked. The path follows along the road for a hundred yards or so and I meet a family of serious-looking cyclists, father, mother and teenage girl. (Actually, thinking about it, I make so many assumptions when I see people. They could be all family friends, or anything, but I’ll leave them as a classic nuclear family for ease of writing.) They are doing various activities, including, as the mother reminds her husband, walking (I wonder if there is a family story there). They ask me about the best bits along the way, and I mention St Trillo’s in Rhos-on-Sea, the Duke of Lancaster and walking over the Severn Bridge. I also talk about the stretch from Chester to Prestatyn being one of the most interesting, including walking through Connah’s Quay. They are from Liverpool, but spend a lot of time in Ll&ycirc;n, yet have never seen the Duke of Lancaster as you do not see it from the road, only by rail. As Liverpudlians, they attribute the difference in atmosphere between Connah’s Quay and Penmaenmawr as solely due to proximity to Liverpool. They clearly know some of the ‘rougher areas’ of Liverpool, but didn’t know about the real ‘problem’ families being shipped out to Rhyl (a bit like transportation to Australia in the 19th century). As the path leaves the road, you go straight through the stone circle, eleven stones of substantial size, and yet unmarked on the OS map. 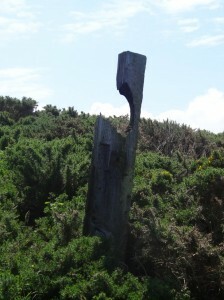 A little further and a single megalith stands on the cliff top, not at the end of a promontory or other obvious natural feature, but presumably placed with some logic of its time. Whether this is connected with the stone circle nearby, or of a completely different age, I can’t tell, and it too is unmarked on the map. Maybe this is simply an area with too many antiquarian features to mark them all. The rocks to seaward around here remind me of the Lost World, rising nearly sheer, but topped with thick vegetation. I can almost see those miniature dinosaurs crashing through the bracken and gorse. 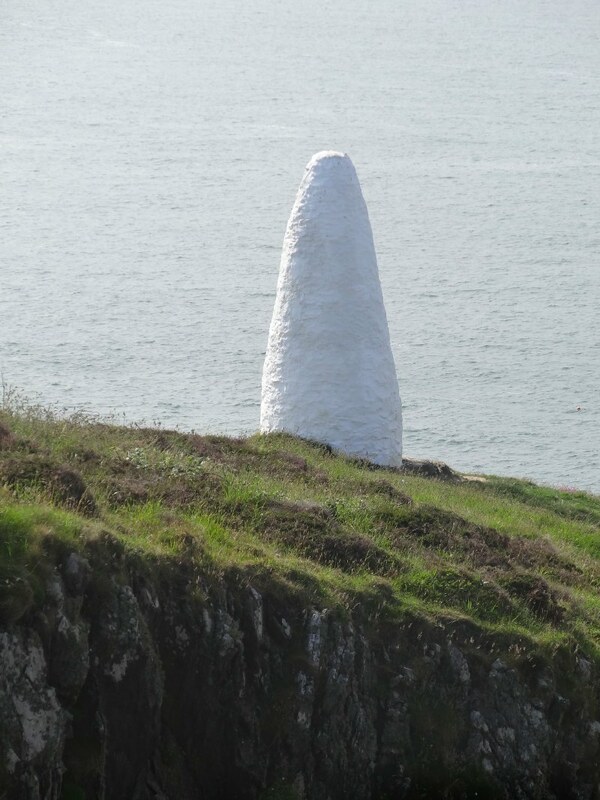 A white sugar loaf, or maybe kulfi, Indian ice cream, is perched on the cliff edge ahead, and beyond it, on the next promontory, is a similar but unpainted stone structure: the harbour markers for Porthgain. Almost at once the broken remains of Porthgain brick and stone works appear. The biggest remaining structures are the remains of huge brick-built stores, or maybe silos, for crushed road rock: Porthgain quarries were once the major supplier for roads across Britain. Each silo would contain rock of a different size, and ships would come and load at the massive quayside. The actual harbour is not huge, but the quays feel that they would not move easily, neither with wild sea nor earthquake. The brick kilns themselves were completely demolished, and old photographs on information boards show the works with its tall chimney. The lady on the bus had told me she remembered when they were demolished with dynamite. I was tired and my feet quite sore by this point as I’d not sat down for five or six hours, so the Sloop Inn in Porthgain was a blessing. The Sloop has photographs of old Porthgain on its wall, quarry workers manhandling huge lumps of stone, and working men in suits, lined up for works photographs. 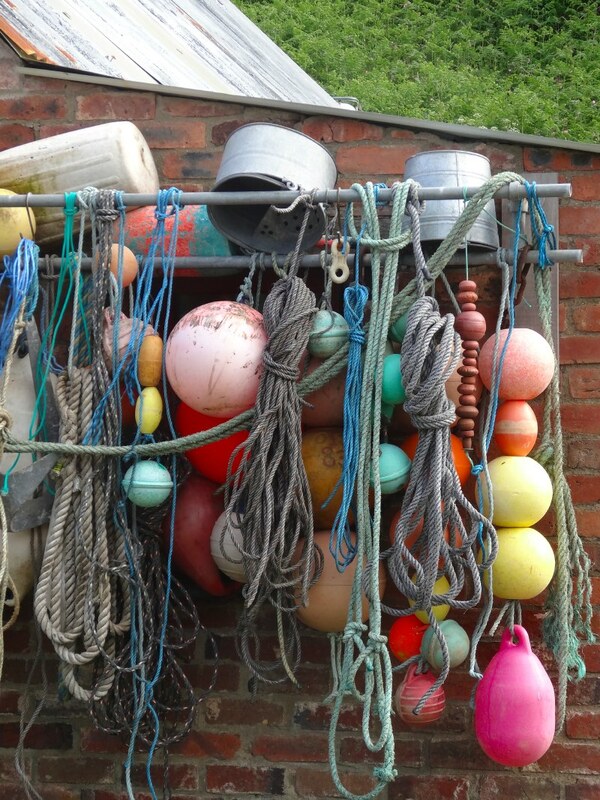 Opposite is the most remarkable building of brick and tin with, it seems, hundreds of rescued shipping net floats of every colour hanging outside. A sign says, ‘Very Sorry. No Mackerel Today’. After this it is just another mile or so past old quarry buildings and low-sun-lit cliffs until the first buildings of Abereiddy appear, and the car park with my campervan waiting for me. I divert slightly off path to see a deeply cut, almost rectangular, cove, clearly the remains of an old quarry by its square-cut sides and the small ruin near its end. The water is a remarkable blue-green colour. Indeed the water along so much of this coast is utterly clear, as few and small streams flow in, so there is little organic matter or silt to cloud it. Going down into Abereiddy I discover this is called ‘the Blue Lagoon‘ and was formed when the quarry shut down and the owners dynamited the narrow neck between sea and quarry, flooding the old quarry floor and leaving a cold lagoon 25 metres deep in places. Finally, and critically, I am in time back at St Davids to visit the wonderful fish and chip shop and get my supper for the night.